Wales based Magical Tree is a cruelty free, vegan friendly, all natural beauty brand that specialize in green products that nourish the skin and improve wellbeing through 100% pure natural oils. If you follow me on Twitter, you know I have been wanting to try the body butters from Magical Tree for ages, and that the brand has been on my wish list of beauty treats to buy for a very long time. So, when I was approached by the lovely Laszlo and asked if I wanted to test out a jar from their upcoming range of body scrubs I was absolutely thrilled to bits. I had heard so many great things about Magical Tree's products, I could not wait to experience the quality myself! There are four varieties of scrub to choose from -- Choko Kiss which blends rich cocoa with fresh peppermint, Flower Power which is packed with full bodied geranium, Sweet Delight with zesty orange and grapefruit, and Velvet Touch which contains soothing lavender and chamomile. Since I have been loving all the roses in my garden lately, I knew I just had to pick the one that brought that feminine floral scent inside with me. When Flower Power arrived, the scrub was completely melted since the temperatures that week were so high, and I have to admit I was a little nervous that the whole thing might be ruined. Luckily that was not a problem -- Laszlo let me know that I could just gently mix the formula, pop the jar in the fridge, and it would be good to go in no time at all. After about ten minutes it had gotten back to the intended consistency and was all set to use -- perfect! Geranium certainly packs a powerful punch, but so does the rest of the formula. Himalayan salt, one of the purest minerals on the planet, contains trace elements that such as calcium, magnesium, and iron which can slowly be absorbed through your skin. The ingredient works to detoxify and improve hydration, and of course acts as a natural exfoliant that buffs away any dead cells and promotes the growth of new healthy, radiant skin. Coconut oils are the finale in this trifecta, and they give necessary moisture while also making the product super light, gentle, and easy to apply. According to Magical Tree, "You can use Flower Power Body Scrub if you would like to feel a floral perfume around you while doing your weekly exfoliation. Rinse your skin with warm water. Stir the scrub with a spatula then dig out a nut sized lump of the gorgeously smelling mixture and gently massage it onto your skin all over your body, sparing out your face. Your skin will be glowing and as soft as a rose petal." 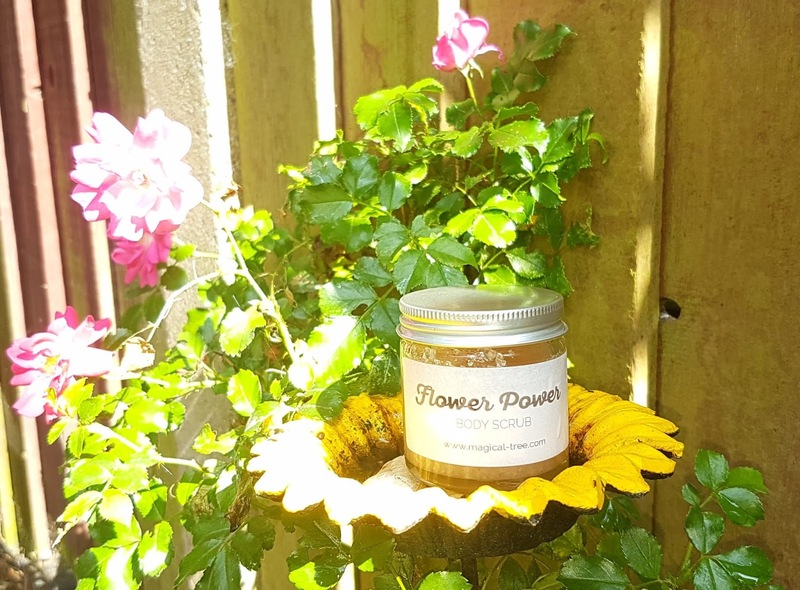 Was my skin glowing after using the Flower Power Body Scrub? You know what, it really was! The salt was the perfect grain to give an effective buff without being too scratchy, and the oils left me feeling soft and smooth. This is seriously perfect to use a day or so after shaving your legs, as it leaves you really silky and your skin just looks so healthy. And the geranium scent sticks around for a long while after you rinse, so it is fantastic if you want a light floral perfume to follow you around. If you want an extra moisture boost (or just want even more of the lovely smell!) you can follow up with a bit of the body butter -- I was lucky enough to be sent a sample pot and have to say, it is luscious!! Beyond the gorgeous qualities of the product itself, I LOVE that the packaging is so environmentally friendly. There is no plastic involved here, as the jar is made of glass, the lid is aluminium, and there is no unnecessary box involved. Even the shipping materials are responsibly sourced! Magical Tree is a brand that you can buy without any associated consumer's guilt. 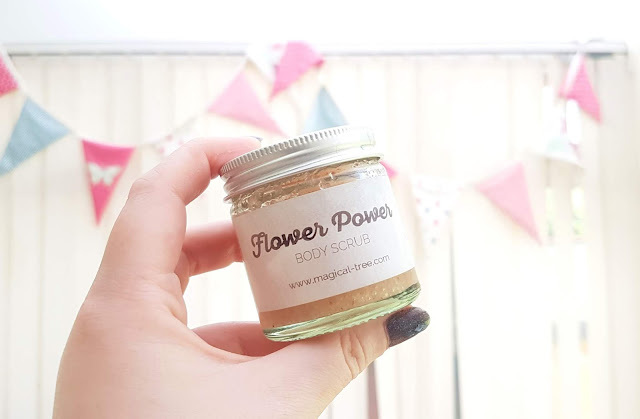 You can now get your own full size 250ml jar direct from Magical Tree for only £19.99 as these body scrubs have OFFICIALLY LAUNCHED just today! And if you haven't purchased from Magical Tree before, you can score a 15% discount by signing up to their newsletter. This would make this newly launched product about £17! With that great savings, maybe even take a minute to check out their range of gorgeous body butters and face serums - they are well worth trying! I LOVE body scrubs so these would be perfect for me. I haven't tried anything from Magical Tree before but will definitely go look at them now. I adore flowers, so I'd have to pick the same scrub as you. I love how environmentally friendly the packaging is too. I love a good body scrub, this sounds amazing! Body scrubs are my favourite. The rougher the better haha. These sound right up my alley, especially the Sweet Delight one.